Rome, the city of love, is one of Europe's top tourist destinations. If you don't like crowds, Rome is probably best avoided. But if you can handle them, and perhaps visit off-peak or walk the city early in the morning or at dusk, you are in for a treat. The list of world-famous attractions includes the Trevi Fountain, the Sistine Chapel and St Peter's Square. Construction of the iconic Colosseum (aka the Flavian Amphitheatre) started in 72 AD, on the orders of Emperor Vespasian. Completed eight years later by his son, Emperor Titus, the elliptical structure is a remarkable feat of Imperial engineering: 188 metres long, 155 metres wide, and 48 metres high, the four-storey Colosseum regularly welcomed 55,000 spectators through its 80 arched entrances. The Colosseum was used for public entertainment, principally fights to the death between wild animals and/or gladiators (often slaves, prisoners of war or criminals). By way of example of the bloody nature of the shows, the 80 AD inaugural games saw the slaughter of over 8,000 wild animals. 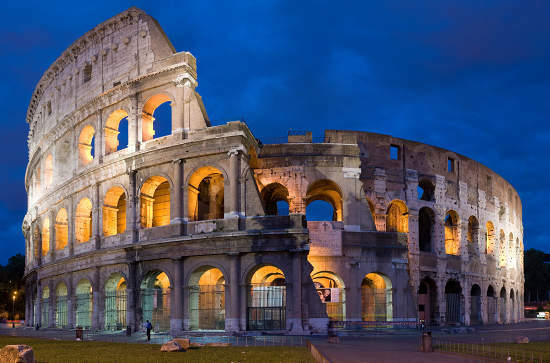 Badly damaged by an earthquake in 1349, which caused the collapse of the south side of the structure, the Colosseum is no longer able to hold large events. But the Colosseum continues to welcome visitors, who despite the crowds can take in this remarkable structure from two levels. where? Piazza del Colosseo - 00184 Roma - Tel. 067004261.
when? All year round, except 25 Dec and 1 Jan. The Colosseum opens at 9.15 am and shuts between 4.30 pm (in winter) and 7.15 pm (in summer). £$€¥ Adults: €16; Young Adults (18-25): €11.50; Children/Seniors: €4. Tickets can be booked online. 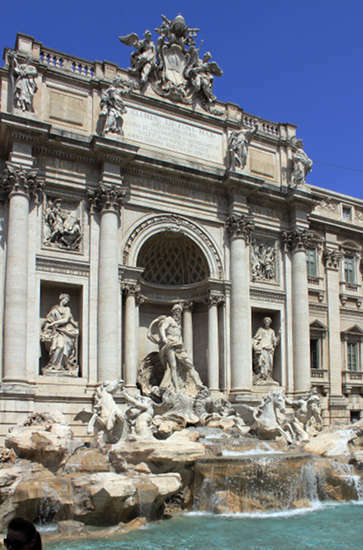 The 85 foot high, 65 foot wide, Baroque Trevi Fountain is one of Rome's principal tourist attractions. Found on Trevi Square, the fountain marks the end of the 20 kilometre long Aqua Virgo aqueduct, which supplied water to ancient Rome for over four centuries after its completion in 19BC. Construction on the Trevi Fountain started in 1732, after a controversial design competition initiated by Pope Clement XII, and was completed in 1762. The Fountain's central feature is a statue of Oceanus (the Roman personification of the ocean), on a shell chariot pulled by hippocamps (mythical sea horses). The sea horses—one calm, the other agitated, to reflect the moods of the sea—are led by Tritons. Rising above the central statue is a large, richly decorated triumphal arch. Its two main niches display statues of Abundance (spilling water from her urn) and Health (holding a cup from which a snake drinks). In total, over 80,000 cubic metres of water pass through the Fountain each day. Legend has it that any visitor who throws a coin into the fountain will return to Rome. An estimated 3,000 Euros are thrown into the fountain each day; the money is used to fund a local supermarket for the homeless. where? Fontana di Trevi, Piazza di Trevi, Rome, Italy. The Sistine Chapel is the most famous chapel in the Pope's Vatican residence, the Apostolic Palace. Designed by Pontelli for Pope Sixtus IV, after whom it is named, the Chapel was built between 1473 and 1481. The Chapel is 143 feet long, 44 feet wide and 68 feet tall—the same dimensions as are given in the Old Testament for the Temple of Solomon. It hosts the Papal Conclave, the meeting at which the new Pope is selected, as well as a number of important services in the Papal calendar. The Chapel is frescoed throughout by Renaissance artists, including Botticelli, Perugino and, most importantly, Michelangelo. 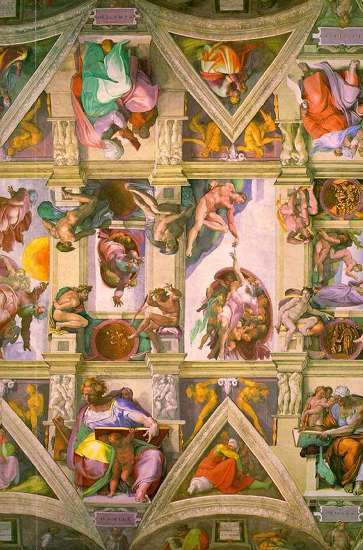 Michelangelo painted the 5,000 square foot ceiling (pictured) with biblical scenes (including Adam and Eve in the Garden of Eden, and the Great Flood) between 1508 and 1512. The ceiling's most famous image is the Hand of God giving life to Adam. Michelangelo was re-commissioned by the new Pope to paint the wall above the Altar: the result, The Last Judgment (1537-41), is a depiction of the second coming of Christ and is considered to be his crowning achievement. The Sistine Chapel is a UNESCO World Heritage Site. 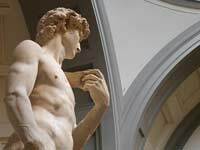 Its majesty caused an eighteenth century writer to comment "Without having seen the Sistine Chapel one can form no appreciable idea of what one man is capable of achieving." where? Lateran Apostolic Palace, Piazza San Giovanni in Laterano (entrance hall of the Basilica, side entrance), 00184 Rome. when? The Chapel is open most Mondays to Saturdays from 9 am to 6pm. Closed Sundays and certain feast days (see the Chapel's website for details). £$€¥ Adults: €15; Children/Students: €8. 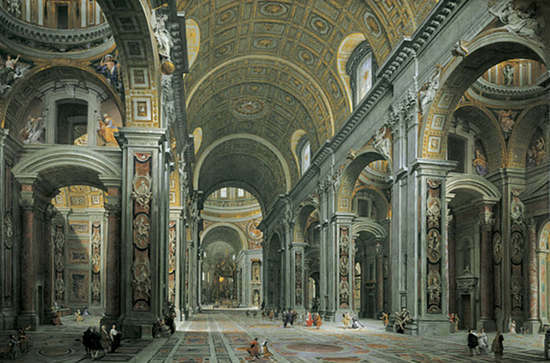 St Peter's Basilica is a late Renaissance church found within the Vatican city. With dimensions of 220 metres by 150 metres, and occupying an area of 5.7 acres, it is the largest church in the world. It is also regarded as the greatest of all churches in the Christendom, and is the burial place of St Peter (one of the 12 apostles and the first Pope) and numerous later Popes. Construction of the current Basilica commenced in 1506 and was completed in 1626. The Basilica's most notable feature is its 138 metre high and 30 metre wide central dome, which dominates Rome's skyline. Inside, the Basilica is richly decorated with marble, reliefs, sculptures and gilding. Two items are of particular note: Michelangelo's Peita, a marble statue of the body of Jesus in Mary's lap after the crucifixion; and the 'Chair of St Peter', an intricately carved wooden chair dating from the ninth century used by numerous Popes and displayed in an elevated position in the apse. where? The Basilica is accessed from St Peter's Square. Metro: Line A (red), Ottaviano-S. Pietro. when? St. Peter's Basilica is open daily. Apr to Sep: 7 am - 7 pm; Oct to Mar: 7 am to 6 pm. Knees and shoulders must be covered. £$€¥ Entry is free. A small charge is levied to access the Dome and the Treasury. 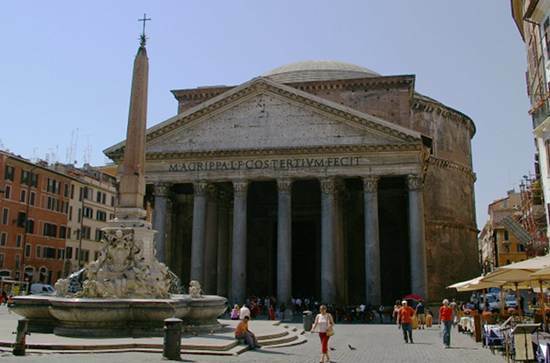 The Pantheon, awarded World Heritage status in 1980, is a huge temple first built by Consul Marcus Agrippa in 27 BC and rebuilt by Emperor Hadrian in 126 AD. Originally dedicated to 'all the Gods', the Pantheon has been used as a Roman Catholic church since the seventh century. It comprises a circular structure with a diameter and height of 43 metres, accessed through a portico (a grand entrance porch). The portico (pictured) is supported by three ranks of huge Egyptian granite columns, each weighing 60 tonnes, leading to the Pantheon's two 20-tonne bronze doors. The circular temple has 25-foot thick walls, supporting its un-reinforced concrete roof. The roof has an oculus (an opening to the sky) which is 27 feet in diameter and which allows sunlight (and rain) into the Pantheon. The roof is decorated with five rings of 28 sunken panels, whilst the lower levels are best known for the niches carved into the temple's walls (displaying statues or frescoes, in particular Melozzo da Forli's Annunciation), various tombs (including those of Raphael and King Vittorio Emanuele II), and a geometric marble floor (slightly sloped to allow rainwater which enters through the oculus to drain). where? Piazza della Rotonda, Rome. when? Mon to Sat: 8.30 am to 7.30 pm. Sun: 9 am to 6 pm. Closed 25 Dec, 1 Jan, 1 May. 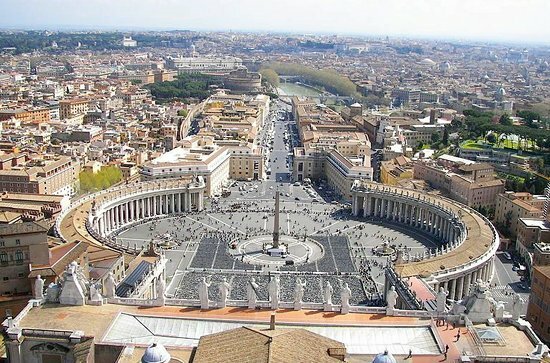 Saint Peter’s Square (Piazza San Peitro) is the massive circular area in front of St Peter’s Cathedral in which crowds gather for papal events, most importantly for the announcement of a new pope. he ‘square’ is in fact an elliptical space, 240 metres wide, with a red granite 41 metre high Egyptian obelisk dating from 1835 BC at its centre (brought to Rome by Emperor Caligula in 37AD). Designed by Gian Lorenzo Bernini, and laid out between 1657-1667 for Pope Alexander VII, the ‘square’ is also adorned by two 8 metre high fountains, one by Carlo Maderno (1613) the other by Bernini (1675)., and a statue of St Paul (erected during the papalcy of Pius IX). Surrounded by 284 thirteen-metre high columns supporting a balustrade, the ‘square’ provides a stunning view of St Peter’s Cathedral (and Michelangelo’s famous 132-metre high dome) and the Loggia of the Blessings. The Loggia is the papal balcony from which new popes are announced with the words ‘Habernus Papem, and from which papal blessings are delivered on special occasions (in particular Christmas and Easter). When jammed to capacity the square can hold over 250,000 people. where? St Peter's Square (Piazza San Peitro), Vatican City, Rome. The city of Florence, the birthplace of the Renaissance, is found a 3 hour drive from Rome. Artistic works by Renaissance greats now adorn the streets and squares of Florence and its world-class galleries: paintings by da Vinci, Raphael and Donatello line the walls of the Uffizi Gallery, the city's premier attraction; Michelangelo's David is the jewel in the crown of the Accademia di Belle Arti, Florence's second art gallery; and the town's squares, such as Palazzo Vecchio, are populated by both tourists and marble statues dating from the Renaissance period. Florence's other great attractions are its Cathedral (the Duomo), with its impressive bellower and dome, the adjacent Baptistry, and the Ponte Vecchio (a bridge spanning the Arno River). the gradual demise of feudalism in favour of a capitalist system. All three features can be seen in Florence, which is often described as the birthplace of the Renaissance. First, Florentines did not care to be ruled by the church. Though a theologian, Friar Girolamo Savonarola, assumed control of Florence in the 1490s, his extreme views saw him burned at the stake in 1498. Even the powerful Medici family struggled to retain control of Florence. It is therefore no surprise that it is in Florence that Niccolò Machiavelli wrote his political handbook, The Prince, advocating strong leadership for Florence coupled with political expediency where necessary (giving rise to the term Machiavellian). Secondly, Florence's economy prospered. This was in large part down to the Medici Bank being headquartered in the city. But other signs of trade are also apparent, most notably when you cross the Ponte Vecchio bridge--home to Florence's jewellery quarter during the 1500s. Thirdly, Florence's squares and galleries are testament to advances in the arts and sciences. Renaissance paintings are characterised by their glorification of the often naked human form (by comparison with the more conservative religious art of the Middle Ages). And Florence's Duomo cathedral has an immense brick Dome, the first of its kind anywhere in the world, marking a significant change from the spire which is ubiquitous in Medieval cathedrals. For these reasons, Florence in the Renaissance is often compared with Athens in the first millennium BC.